Many organizations like to offer their existing students priority in the upcoming session class selection. This may be open to only active students or it may include all students in your database, both active and inactive. Typically this is done by opening enrollment to the existing students a few days before allowing brand new students to enroll into those classes. A combination of Class settings and Parent Portal settings will allow you to offer online priority registration to your existing customers. The classes will not be available for enrollment in your class listings for Online Web Registration (used by new students). They will only be available through the Parent Portal (used by existing students). If you are using the Class listings tables on your website, you can set Display on Website to Yes and the class will show without a Register link. If you set Display on Website to No it will not be shown in your listing table at all. Finally, set the Registration Start Date to the date you want to allow Portal enrollment to begin. You can mass update an entire group or session of classes at once using the Classes > Edit All Classes function and selecting the group or session that you need to update, then using the Global edit section to mass edit changes.This is a great way to quickly edit all the classes based on a particular new Session that is starting. 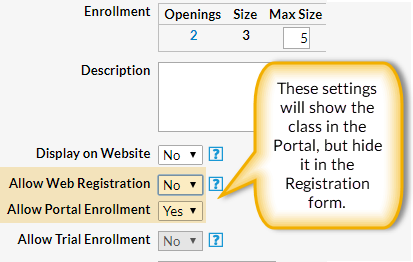 If you only want to allow currently active students to enroll, and not students that aren't currently enrolled in class(es), you also need to select the Prevent Inactive Families from enrolling setting in the Enrollment Settings section of the Parent Portal Settings (Tools > Parent Portal > Settings). Because priority enrollment is a privilege you will also want to prevent any of your existing families that are designated as Problem Families from enrolling. The Prevent Problem Families from enrolling setting in the Enrollment Settings section of the Parent Portal Settings (Tools > Parent Portal > Settings) can be selected to block families that have had the privilege removed. Once Priority enrollment is finished and you want to open up the class(es) to the general public (new customers), change the Allow Web Registration setting to Yes for the classes. Clear the Prevent Inactive Families from enrolling checkbox if you had it selected. Keep in mind that a new family can still use the Registration form to enroll into other classes that are allowing Web Registration. Once the new family is created in your database, they will then have access to the Parent Portal and will be able to see and enroll into the Priority classes. There is not a way to totally prevent this from occurring unless you want to revoke all new registrants' Portal access during your priority date range.